Greenwich’s Stephan Todorovic swims the butterfly leg of the 200-yard medley relay during the FCIAC Swimming Championships on Feb. 28 at Greenwich High School. Such is the case with the tradition that exists at Greenwich High School, where its boys swimming team has a penchant for gathering together and performing its best when it counts the most. Once again showcasing its superior depth, Greenwich continued its reign of supremacy, winning its 12th consecutive FCIAC title and 48th in 49 seasons, totaling a team score of 429 points at the conference finals on Thursday. New Canaan, which also produced an outstanding performance at the FCIAC Championships, was the runner-up with 372 points, followed by Ridgefield (328), Darien (249) and Staples (219). Westhill/Stamford was sixth (159) and Norwalk/McMahon placed seventh (133) before a spirited crowd at Greenwich High School. The Cardinals captured the first-place medal in one event, but were well represented in each race, enabling them to amass points in each event. Greenwich began the FCIAC finals in championship form, as the foursome of Justin Jacob, Thomas Lewis, Stephan Todorovic and Nick de la Sierra combined for a winning time of 1:35.47. Ridgefield finished second (1:36.86) and Westhill/Stamford placed third 1:38.17. The 200-yard freestyle finals saw Ridgefield sophomore Connor Hunt win the first of two individual titles. Hunt touched the wall in a winning time of 1:41.74. Staples senior John McNab placed second (1:42.43), while New Canaan’s Jake Ritz was third (1:43.45) and Darien’s Spencer Erickson took fourth (1:44.52). In the 500-yard freestyle, Hunt claimed the first-place medal, clocking in at 4:33.06. Ritz of New Canaan was the runner-up (4:42.44) and Alexander Plavoukous of Greenwich finished third (4:46.06). Karl Wadleigh of Darien placed fourth (4:46.06). Greenwich earned a lot of points in the 500 freestyle, as Thomas Cass took fifth in the event. Hunt, who still has two years to break Smith’s mark, was impressed with his squad’s overall performance. New Canaan junior Patrick Colwell won the 200 individual medley title, posting a time of 1:54.09. Fairfield co-op sophomore Emmett Adams placed second (1:55.73), followed by Ridgefield’s Luke Hruska (1:56.75). Lewis had a fourth-place finish for GHS (1:56.77) and Danbury’s Shane Simmons took fifth (1:57.29). Lewis also finished third in the 100-yard breaststroke for the Cardinals (59.18). The 50 freestyle was one of the closest races, as Ridgefield senior Will Bryant touched the wall first in 21.31 seconds. Right behind him was Greenwich’s Nicholas Malchow (21.53) and Michael Kotlyar (21.67). The meet’s MVP honors went to Westhill/Stamford’s Ben Feldman. The junior standout won the 100-yard butterfly title with a time of 49.51 seconds. Connor Martin of Darien placed second (51.85). In the 100-yard breaststroke, Feldman built a lead early on his way to winning the race in 57.48. Kotlyar took second (59.14). McNab garnered the first-place medal in the 100 freestyle (46.74). Colwell was the runner-up (47.28) and Greenwich’s Charlie Clark finished third (47.72). The 100 freestyle was another event for Greenwich racked up substantial points, as Malchow took fourth and de la Sierra finished fifth. The 200-yard freestyle title went to New Canaan (1:26.43). Greenwich placed second (1:27.37). 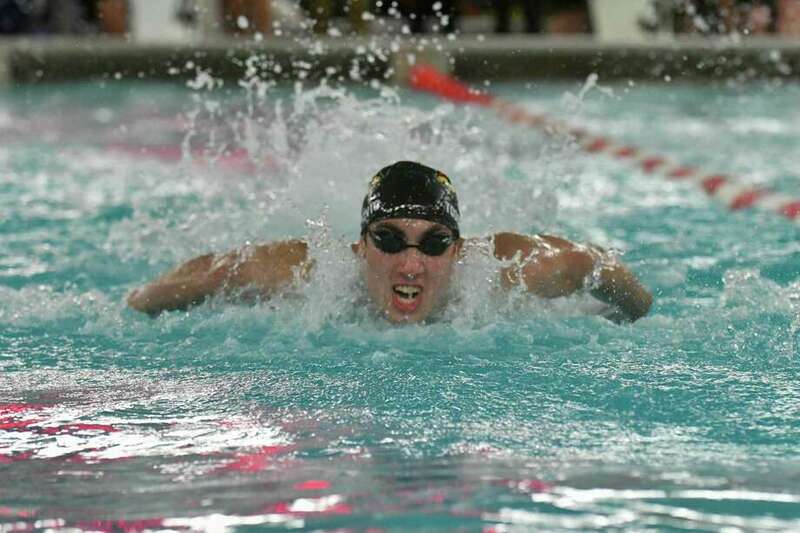 Staples’ Austin Twiss (52.41) edged Ridgefield’s Andrew Yu (52.69) for the 100 backstroke championship. Erickson of Darien took third. New Canaan produced a championship time in winning the 400 freestyle relay (3:11.99). Greenwich finished second in 3:13.07. The Rams fell just short of an FCIAC record in the event set by Greenwich in 2011 (3:11.42). 1. Greenwich 429 points; 2. New Canaan 372; 3. Ridgefield 328; 4. Darien 249; 5. Staples 219; 6. Westhill/Stamford 159; 7. Norwalk/McMahon 133; 8. Fairfield co-op 127; 9. Trumbull 89; 10. Danbury 53; 11. Wilton 33. 200-yard medley relay – 1. Greenwich 1:35.47; 2. Ridgefield 1:36.86; 3. Westhill/Stamford 1:38.17; 4. Staples 1:38.62; 5. Darien 1:38.87; 6. New Canaan 1:39.43; 7. Norwalk 1:41.53; 8. Fairfield 1:42.11. 200-yard freestyle – 1. Connor Hunt (Ridgefield) 1:41.74; 2. John McNab (Staples) 1:42.43; 3. Jake Ritz (New Canaan) 1:43.45; 4. Spencer Erickson (Darien) 1:44.52; 5. Ethan Murray (Ridgefield) 1:44.89; 6. Karl Wadleigh (Darien) 1:45.24; 7. Andres Ruh (Greenwich) 1:46.35; 8. Connor Martin (Darien) 1:47.26. 200 individual medley – 1. Patrick Colwell (New Canaan) 1:54.09; 2. Emmett Adams (Fairfield) 1:55.73; 3. Luke Hruska (Ridgefield) 1:56.75; 4. Thomas Lewis (Greenwich) 1:56.77; 5. Shayne Simmons (Danbury) 1:57.29; 6. Ryan Jee (Greenwich) 1:59.32; 7. Christopher Dauser (Norwalk/McMahon) 1:59.84; 8. Thomas Dupont (Darien) 2:02.06. 50 freestyle – 1. William Bryant (Ridgefield) 21.31; 2. Nicholas Malchow (Greenwich) 21.53; 3. Michael Kotlyar (New Canaan) 21.67; 4. Nicholas de la Sierra (Greenwich) 22.05; 5. William Crecca (Trumbull) 22.13; 6. Mark Merson (Greenwich) 22.25; 7. Matthew Freeman (Darien) 22.57; 8. Justin Lessing (Staples) 22.68. 100 butterfly – 1. Ben Feldman (Westhill/Stamford) 49.51; 2. Connor Martin (Darien) 51.85; 3. Linney O’Malley (Ridgefield) 52.35; 4. Henry Valazquez (Norwalk/McMahon) 52.36; 5. James Pascale (Greenwich) 52.64; 6. Richard Ettinger (New Canaan) 52.91; 7. Justin Lovro (Staples) 53.31; 8. Stephan Todorovic 51.79. 100 freestyle – 1. John McNab (Staples) 46.74; 2. Patrick Colwell (New Canaan) 47.28; 3. Charles Clark (Greenwich) 47.72; 4. Nick Malchow (Greenwich) 47.79; 5. Nicholas de la Sierra 48.45; 6. Andrew Yu (Ridgefield) 48.70; 7. Brian Harrell (New Canaan) 49.63; 8. Gianfranco Pozzolini (New Canaan) 50.25. 500 freestyle – 1. Connor Hunt (Ridgefield) 4:33.06; 2. Jake Ritz (New Canaan) 4:42.44; 3. Alexander Plavoukos (Greenwich) 4:46.06; 4. Karl Wadleigh (Darien) 4:46.25; 5. Thomas Cass (Greenwich) 4:47.37; 6. Nick Lott (Staples) 4:55.60; 7. Jackson Oehmler (New Canaan) 4:55.75; 8. Matthew Johnston (Ridgefield) 4:58.29. 200 freestyle relay – 1. New Canaan 1:26.43; 2. Greenwich 1:27.37; 3. Ridgefield 1:27.72; 4. Westhill/Stamford 1:28.04; 5. Fairfield 1:31.99; 6. Darien 1:32.06; 7. Staples 1:32.82; 8. Trumbull 1:34.09. 100 backstroke – 1. Austin Twiss (Staples) 52.41; 2. Andrew Yu (Ridgefield) 52.89; 3. Spencer Erickson (Darien) 52.84; 4. Gianfranco Pozzolini (New Canaan) 53.71; 5. Justin Jacob (Greenwich) 53.99; 6. Richard Ettinger (New Canaan) 54.51; 7. Matthew Johnston (Ridgefield) 55.92; 8. Nick Lott (Staples) 56.29. 100 breaststroke – 1. Ben Feldman (Westhill/Stamford) 57.48; 2. Michael Kotlyar (New Canaan) 59.14; 3. Thomas Lewis (Greenwich) 59.18; 4. Shayne Simmons (Danbury) 59.38; 5. Emmett Adams (Fairfield) 59.41; 6. Christopher Dauser (Norwalk/McMahon) 59.93; 7. William Bryant (Ridgefield) 1:00.39; 8. Luke Hruska (Ridgefield) 1:00.72. 400 freestyle relay – 1. New Canaan 3:11.99; 2. Greenwich 3:13.07; 3. Ridgefield 3:13.59; 4. Darien 3:16.19; 5. Staples 3:16.58; 6. Norwalk/McMahon 3:18.05; 7. Fairfield 3:28.73; 8. Westhill/Stamford 3:33.56.